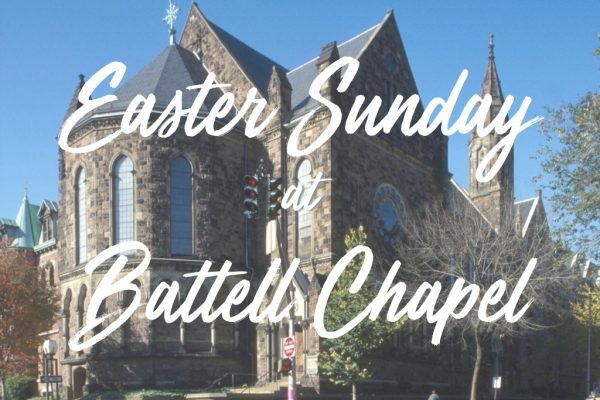 Join us for Easter Sunday at Battell Chapel! This year we will celebrate Easter in Battell Chapel. The Sanctuary has SO MUCH space so be free to invite ALL your friends! Service starts at 4pm. After the service we will go across the street to our usual location (corner of College and Wall) to enjoy a potluck dinner with everyone. Wondering what to bring? Last name starts with A-O Side dish Last name starts with P-Z Salad (Green or otherwise) (No desserts please!) ECV will be providing Easter hams and a delicious vegan main dish! Join us for Easter Sunday at Battell Chapel! This year we will celebrate Easter in Battell Chapel. The Sanctuary has SO MUCH space so be free to invite ALL your friends! Service starts at 4pm. After the service we will go across the street to our usual location (corner of College and Wall) to enjoy a potluck dinner with everyone. Wondering what to bring? ECV will be providing Easter hams and a delicious vegan main dish!